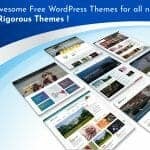 RT Magazine: Best Free WordPress Magazine and News Theme! 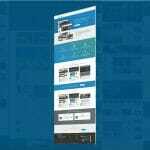 RT Magazine: Free WordPress Newspaper Magazine Theme! No matter how detailed and thorough a book, magazine or newspaper may be, the competition now lies online! That’s right, with the craze of digitalization taking over every business category, editorial or magazines are no exception. Which means that more and more companies are joining the battle of websites online! While there are tons of platforms you can start up, if you are one of the WordPress users then you are at the right place. We at Rigorous Themes aim at providing our users with nothing but the best. We have an exclusive collection of themes of all different niche you can choose from. However today we wanted to talk about our yet another amazing addition- RT Magazine! 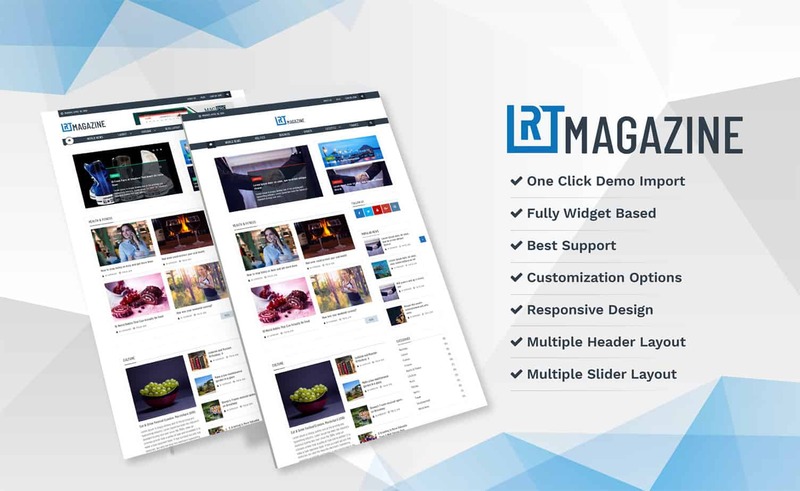 RT Magazine theme is one of the best Free WordPress Magazine News themes that is simply the best choice for you! A clean and professional looking interface, this theme is perfectly suited for the online magazine, newspaper or any editorial based websites! RT Magazine is flexible, dynamic and fully responsive. Of course, you might have come across tons of other amazing options, but we are sure that once you try out RT Magazine, you will never want to switch to any other theme! Featuring a modern and interesting design format, keep your users engaged for hours on end. Capture any visitor’s attention instantly as this online magazine theme features colorful and customizable layout. It is also extremely easy to use which means that absolutely no coding knowledge is required! The custom widgets add the extra appeal to this online magazine theme. You also get Multiple Header Layouts that you can choose from. So why not try it out today and get the best online experience with RT Magazine? But that is not all, if you are looking for more features and additional functionalities, it is also available! Switch to the RT Magazine Pro in a matter of minutes! Get even more amazing features and create stunning websites to keep your users engaged for hours on end! RT Magazine has now made creating a website even more convenient with the one-click demo importer. This theme lets you import the pre-built demo pages in a single click and allows you to create a professional looking online magazine website in no time. Even better, adding, deleting or editing the elements is all your choice. What’s great is that this template offers multiple demos which means that no matter what niche you prefer, RT Magazine has taken care of it all. Making sure that you have enough options to keep your users hooked onto your site is now not a hassle! RT Magazine offers 2 different Header variations that you can choose from. You can either choose to display advertisements on the header or simply display the logo of your company. Whatever you choose, this options makes sure that your preference is met! Fully Widget Based Layout with Custom Widgets! The simple to use and build on, RT magazine is a fully widget based theme. This means that you can add any elements within a matter of minutes using the widgets available. But the best part about this is, you also get Custom Widget options with this! For your convenience, with this free theme, you get 8 different custom widgets that you can use. With great performance, we would also like to mention that our WordPress online magazine theme RT Magazine features amazing support. Our support team is dedicated and aim to provide the best of support for our users whenever they are in need. Reach out to us through Live Chat, Support Forums or through our detailed documentation. RT Magazine features a fully responsive design layout which means that it can easily adjust with any screen size. Whether it is desktops, laptops or tablets, this template makes sure that your website looks amazing no matter which device it is displayed on! Another amazing and unique feature of this template is that you can pick out category color option. You can choose which color to represent which category for the easier navigation and accessibility for your users. Choose from the unlimited color palette and pick out the one that works the best for you! Highly customizable with galore of customization options. Beautifully designed multiple header and slider layouts. Archive Page Layout option available. Among hundreds of themes available for the purpose, RT Magazine is just one of its kind with profoundly beautiful and jaw-dropping premium like features. If you are looking for a magazine theme for creating an enduring magazine website and that is not just visually alluring nut also fully-functional, then look no further than this theme. Best of all, these all amazing features come for free. If a free theme has such mind-blowing features, just think for a moment what the pro version of it might have in store? So, if you need more advanced features to further enhance the look and feel of your WordPress site then you can try out the pro version of RT Magazine as well. But whether you opt for a lite or pro theme, they both will boost the online presence of your online news or magazine site. Also, they assure you the better functionality your website. Do you have any queries? Are you dealing with some theme related issues? Just connect to our dedicated support team and let us help you do wonders with your magazine website.